Building a homemade table saw by inverting a circular saw onto a piece of plywood and fastening it with screws or bolts is an economical way to utilize the versatility of the circular saw. Although manufactured table saws are built more precise, many woodworking projects require a table saw to rough cut material. This method for building a table saw is ideal for a small woodworking shop on a budget. Place the circular saw on a solid work surface. Insert the 3/16-inch drill bit into the drill and tighten it. Drill eight holes into the circular saw base, one in each corner and one centered between each of the corner holes. The base is the flat plate on the bottom of the circular saw. Place the 4-by-4 plywood piece on the two sawhorses. Raise the blade on the circular saw by unlocking the depth lock near the base of the saw, allowing the saw base to set flat on the plywood. Mark the center of the plywood by marking an intersecting center line for the length and width of the plywood, measuring 24 inches from each perpendicular side of the plywood. Place the circular saw on the surface of the plywood and center the blade on the center marks. Install eight 3/4-inch screws into the saw base into the plywood. Unlock the depth lock located above the saw base. Plug in the power saw and firmly grasp it. Press the power trigger and slowly lower the saw, plunging the blade through the plywood until the full depth of the blade is achieved. Unplug the power cord and lock the depth lock. Turn the plywood over on the sawhorses, exposing the saw blade on the surface of the plywood. Screw the plywood into the top of the sawhorses with the 1 1/4-inch screws. Screw the saw base to the roughest side of the plywood. This will leave the smooth side for the top surface, making it easier to push the material through the saw. Use caution when plunging the saw blade through the plywood, grasping the saw firmly when cutting. Wear safety glasses when operating hand and power tools. 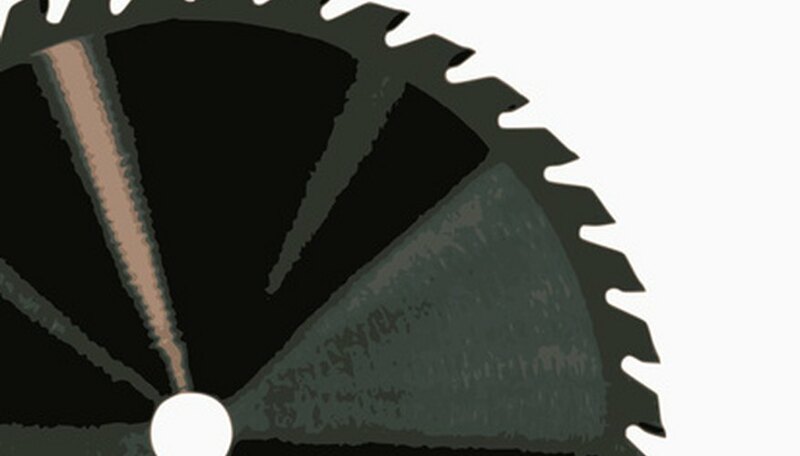 Most saws are equipped with blade guards. This saw does not have a guard. Use extreme caution when cutting and always use push sticks and feather boards when needed for small work pieces. Brian Scudder began writing in 1985. His articles appear on various websites. In 2005 he was elected to the United Brotherhood of Carpenters and Joiners of America as an instructor. Scudder studied creative writing at the University of Cincinnati.